QA1 won the Materials and Process Innovation Award from the American Composites Manufacturers Association (ACMA) during the 2015 Composites and Advanced Materials Expo (CAMX) in Dallas, Texas. CAMX, produced by ACMA and the Society for the Advancement of Material and Process Engineering (SAMPE), is the premier conference for composite material products, solutions, networking, business, and advanced industry thinking. During CAMX, ACMA presents its Awards for Composites Excellence (ACE) to companies who implement innovation in three categories: composites design, manufacturing or market growth. 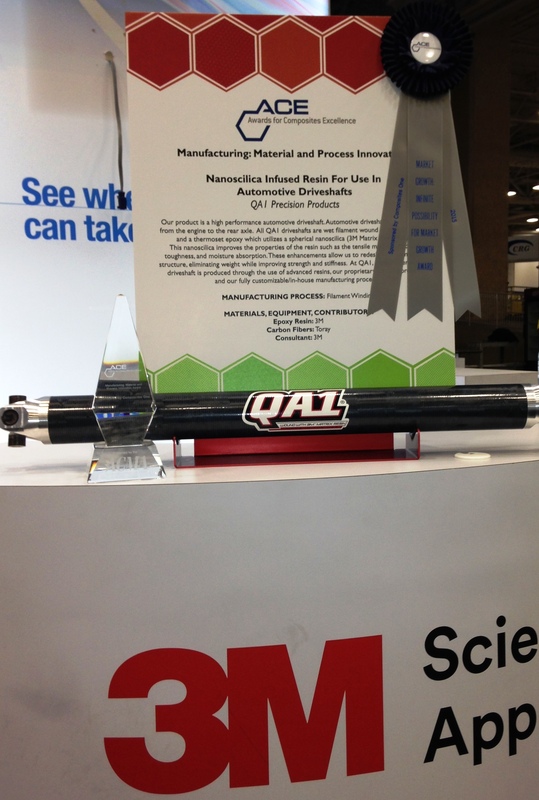 QA1 won in the manufacturing category for its nanosilica infused resin for use in performance automotive carbon fiber driveshafts. They partnered with 3M™ to develop this exclusive Matrix Resin that has improved compressive strength, fracture toughness and reduced water absorption. These enhancements allow for redesign of composite structures, eliminating weight while improving strength and stiffness. QA1 manufactures carbon fiber driveshafts for drag racing, street performance and dirt late model racing. They are designed and manufactured in-house at QA1’s Lakeville, Minnesota facility using the latest filament-winding equipment. QA1’s carbon fiber driveshafts are lighter, stiffer and stronger than aluminum, steel and other carbon fiber driveshafts, all while providing dramatic safety benefits.